The latest additions to Safari Adventures have just stepped paw onto Mauritian soil; two endearing little lion cubs, Kimba and Kiara, that delight and enthral with their inquisitive and playful behaviour. After thirty days of quarantine the cubs are eager to meet new people and mingle with them. Safari Adventures is one of only three places in the world where you can interact with Lions and Cheetah. The cats are trained from an early age to treat people with respect and they are used to being stroked and patted and being around people generally. Indeed, they are so well trained that the cheetah are used for educational events and promotions. All interactions with the felines are photographed by trained staff with professional equipment and the pictures are of course available to anyone who participates in the event. For those of you who prefer to see the cats in a more natural setting, it is possible to “walk with the lions”. Each walk lasts approximately an hour to an hour and a half and consists of a small group of people and two lions. It gives you the opportunity to mix with the lions and form a unique lion-human “pride”, providing a once in a lifetime experience. The adventure is video recorded and photographed for posterity and naturally a DVD of the event is available afterwards. The new cubs are only seven months old and yet the difference in size between the male and female is very apparent. 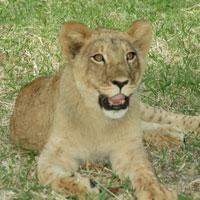 Kimba is noticeably more authoritative and dominant than his sister, due to the male role as protector of the family. Females are more agile and are the pride’s hunters, however, after they have caught their prey, the males and cubs eat first, the females are not permitted to eat until the males have sated their hunger. Like most mammals, Kimba’s and Kiara’s mood can be interpreted by their body language and they have a very good temperament. Being desert lions they are quite pale in colour as this helps them reflect the heat and also provides them with superb camouflage. Visiting Safari Adventures should be a priority for anyone and is certain to create life-long memories. So leave all your worries behind and take a walk on the wild side. You’ll love it!